I got a letter in the mail today, then I proceeded to hyperventilate, seriously ask Gillian. 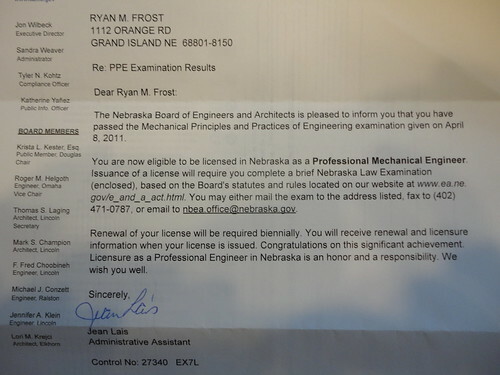 This letter informed me that I had passed the Mechanical Principles and Practices of Engineering examination. I passed the PE, I passed the PE, I…passed…the…PE!!! Thank you to everyone for the support and special thanks to my wife, Gillian, who had to put up with me being all kinds of crazy over the last 6 months. So, I would just like to say Booyah! and thank God I don’t have to take it again! This entry was posted on May 28, 2011 at 9:56 pm and is filed under News, Work. You can follow any responses to this entry through the RSS 2.0 feed. You can leave a response, or trackback from your own site. There was no doubt in my mind that you would do it on the first try. Great job!